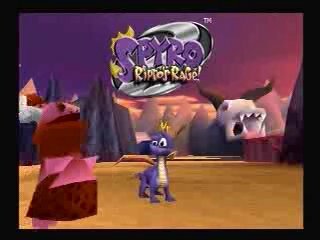 ﻿ Speed Demos Archive - Spyro 2: Ripto's Rage! Developed by Insomniac Games and released for the PlayStation by Sony Computer Entertainment in October 1999, Spyro 2: Ripto's Rage! is a three-dimensional platformer and the second installment of the popular Spyro the Dragon series. The protagonist must travel through the fictional world of Avalar and combat the evil sorcerer Ripto. Best time with large-skip glitches: Single-segment 0:29:23 by Matt 'Crash41596' Leblanc on 2011-12-02. Best 100% time: Single-segment 2:48:57 by Matt 'Crash41596' Leblanc on 2011-09-03. Single-segment with large-skip glitches: 0:29:23 by Matt Leblanc. Hello people of sda this is Matt Leblanc aka Crash41596. This is my Spyro 2 any% run done in 29:22. I have put much time and effort into this run, so I hope you all enjoy this run. - Route: The gem route has changed because of how slow the main level is. So instead of going the intended way I go the back way. With the old route of this level, I would leave with about 125 gems, but now I leave with about 90 gems because there are other gems worth getting. - Execution: Everything went fine, excluding one wall bump, so I could save about 1 second on that. - Route: The big difference in this route is the rocket. I decided that the rocket/chest is not worth getting, because of how much time it takes to glide down to the chest in general. You can get the same amount of gems faster, if you don't skip any baskets. I ended up leaving the level with 301 gems, and the tas left with 357 gems. The tas got way more gems due to glimmer, and the fact that the tas gets every gem possible while waiting for the guys in Idol Springs. - Execution: This level went very well, I could only see a minor improvement with the timing of the doors opening. - Route: I start off by doing what the tas does, but with a faster strat. You can do a charge jump through the idol's head instead of a double jump. then I end up getting the two 10 gem jars by the statues. 20 gems is a good exchange for 5 seconds. Then I end up doing everything basically the same as the tas. I ended up leaving with 509 gems, the tas ended up leaving with 521 gems. - Execution: overall I could have saved about 5 seconds with the bit of failure I had. I stuffed up on going through the idol head smoothly, and messed up the skip up to the roof which lost about 4 seconds. - Route: I get 25 extra gems at the start, which only takes 3 seconds. I really don't know why the tas didn't get them. -Execution: I ended up bonking into the enemy at the start of the level, and had a slow end level skip, but everything went pretty well. - Route: This is where things get much different. Since I am doing Zephyr before Shady Oasis (Which is faster) I am going to need a tad bit more gems then usual. I end up getting 39 gems in 4 seconds at the start of the level, and before the door skip I end up getting 25 more gems which takes less then 2 seconds. so in total 64 more gems in 6 seconds. Everything else is pretty much the same. -Execution: This level was one of the best levels in the run. I could only see myself saving 2 seconds. 1 second for the troll turtle, and another for me getting a bit stuck at the first tunnel. So overall, it was a pretty good level. - Route: Nothing has changed. -Execution: The level itself went very well, but getting to it is another story. I ended up losing 2 seconds on the way to the level. The level itself was very good. There's 1 skip I do not do in Aquaria, and that is the jump after the 2nd switch. If you do not know What I am talking about, please refer to the tas. The trick only saves 2 seconds, and failing it loses you 1 second. So it is not worth going for because of how inconsistent it is. I don't see any improvements excluding the skip. -Execution: I didn't lose time on the boss, but I got hit once by the falling rocks, which was not intended. -Route: This is where the new major skips start. I start off with the ground level version of the caveman skip, then I do a new version of the tas bone skip, which skips the 2nd wave of cavemen, and is also faster then the tas. I then do what the tas does. -Execution: This was my favorite part of the run. I got both hard tricks on my first try, the only thing that went wrong was that one 5 gem I missed :/. -Route: Not sure if the tas used the boat skip to get the talisman, but if so the route is the same. -Route: I get an extra 55 gems in 8 seconds, which is real nice. -Execution: I could have probably saved time on the movement, but everything went well enough. -Route: I do this level earlier then in the tas, because the 75 gems on the island are not worth getting, and can be made up with in 10 seconds. Now for the overall level. I pretty much do the same tricks as the tas. -Execution: I could have saved about 4 seconds on this level. I ended up wall bonking, then missing a cannon shot. Worst of all, I was sitting at the talisman keeper for 1 seconds because I was looking at my stream chat. I am not very proud of this level, but it is okay for a run with this time. New Climb Skip: This is done right after zephyr which allows you to skip going all the way around the island, it is about 14 seconds faster then the normal climb skip. -Execution: Probably the worse level in the run. I could have probably saved about 7 seconds, and gained 5 extra gems. -Route: The same as the tas, excluding one trick. -Execution: Lost about 3 seconds overall, because of me not getting a edge glide on the 3rd satire. everything else went fine. -Route: I use a faster method of getting to the top of the volcano. I get 2 enemies then use the super fly power-up to reach the volcano, which is faster then gliding over. I also don't need to go around the side of the level. -Execution: I could have saved about 5 seconds due to me not paying attention to where I was gonna land. - I wasted 4 seconds over-collecting gems. I should have looked at my gem counter :x. -Execution: I may have lost a fews seconds due to not manipulating shorty(The Hippo) correctly. Everything else went fine. -Execution: Gulp is too luck based, and it seems as if I got very good luck with him this time around. This is the best Gulp that I have ever gotten in a run. I nailed every double hit except one, which is really good. This boss battle decides whether a run is good, or bad. I am just very happy with the out come of this battle. Winter Tundra: Got swim in the air, nothing else to see here. -Execution: This boss didn't go as well as Gulp, but it was an okay boss. I got a 3 cycle 1st phase, and a 4 cycle 2nd phase. The 2nd phase actually went really fast, due to the orb placements. The final phase didn't have any problems as well. Conclusion: I don't think I will ever top this run, but I may come back to this category some day if new skips are discovered. I am very pleased with this run, and I hope you all enjoyed watching this. If you want to see other Spyro related runs, visit my stream http://www.twitch.tv/crash41596 where I speedrun various categories of Spyro games. 100% Single-segment 2:48:57 by Matt Leblanc. Howdy everyone this is Crash41596 back again with another speed run. This time I am doing spyro 2 instead of spyro 1. This run was real good ,but it could use some improvement overall. I think it is possible to get a sub 2h35m run, but only time can tell. "Time starts when I start moving in glimmer ,and ends when I hit Ripto with the last fire ball"
Glimmer - Glimmer is the first stage in the game, and by far the easiest. I also managed to go through the level easily. Colossus - Took a while to get a good route for this level, seeing how you have to get lucky with hockey, but there was no real problem with this level. Idol Springs - This level is real hard to get a good time just because of that blasted fish challenge, you have to get so damn lucky with it. Hurricos - Hurricos was real hard to make a route for, the gems are spread out so it took me a while to make a route for hurricos. I also did not have any problems with this level. Sunny Beach - This is probably my favorite level in Summer Forest. I kind of stuffed up in the beginning of the level when I failed the skip, and fell in the water. Ocean Speedway - This was probably the worst part of this speed run. It is the worst part because I failed the speedway, and the challenge. "I really dislike this speedway >:( "
Aquaria Towers - This level includes my first death of the speed run. I forget about the patch of sharks in the sub area. Spyro basically was eaten :C.
CRUSH - This boss is very easy. "No problems"
Skelos Badlands - I think I went a little slow on the lizard challenge ,but I probably didn't. Crystal Glacier - I really dislike the flying challenge seeing how there's no good way to get the gems, and do the challenge at the same time. On the other hand the Gorge challenge is probably my favorite challenge in the entire game. :) I also did the skip at the beginning of the level perfectly without fail. Metro speedway - This is by far my best speedway in the game. I never have problems with this speedway. Breeze Harbor - I really dislike this level, but at least I did well in it. Scorch - I really hate chasing that red smurf, he's a real pain. Fracture Hills - I basically had to go to the level twice too 100% the level, because I needed head bash. Shady Oasis - This is another level that I had to revisit because of head bash. Icy Speedway - I don't really like or hate this speedway, but the challenge can be a pain sometimes. I am just glad I did not fail the challenge. Zephyr - The longest level in the game. I did every skip perfectly in this level. GULP - The longest, and most annoying boss in the game. Kinda sad that I didn't get the skill point. Cloud Temples - I have a great route for this level, which makes it about 5 minutes long. Mystic Marsh - I really REALLY hate this level, but yet again everyone does. I kept on getting hit ,and I had some real close life/death experiences in this level. Robotic Farms - I failed to get the metal chest twice I believe, which cost about 1m. Canyon Speedway - I almost did as bad as Ocean Speedway. RIPTO - This was kind of the point where I was rushing the run, but it turned out great in the end. In the end I arrived in dragon shores and got the super flame. I hope you enjoyed the speed run, and I will try an do a spyro 3 single segment 117% run. But it's probably not going to happen.